Boxer vs. Berdan Primers - What's the Difference? Boxer vs. Berdan Primers – What’s the Difference? 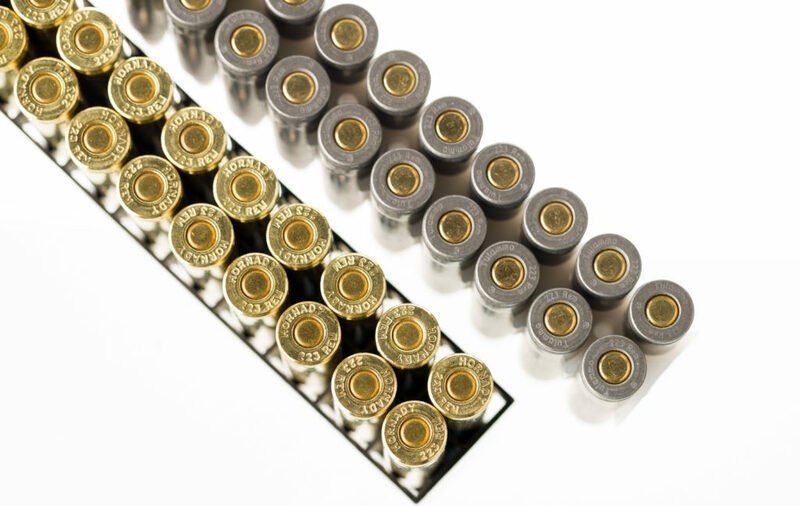 Give this article a look for a detailed comparison of ammunition that uses Boxer primers and rounds loaded with Berdan primers. Boxer vs. Berdan primers – what’s the difference? If you’re a general-use gun owner who isn’t too concerned about how your ammo works, it may not be a concern. However, if you are interested in reloading, it makes a big difference. 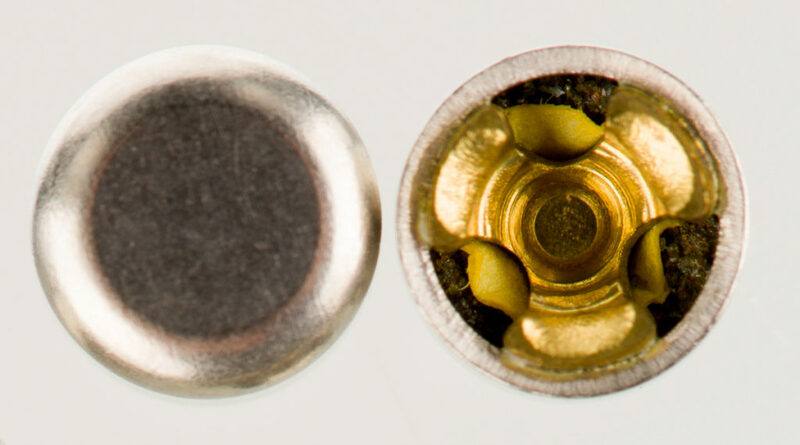 Either way, if you’re into ammo like we are, you probably want to know about this vital element of cartridge assembly. The major difference between Boxer and Berdan primers has to do with flash holes and the anvil. So, it helps to take a quick moment to understand these parts of a cartridge. Flash holes are the holes in the base of the casing between the primer recess and the space for the powder load. 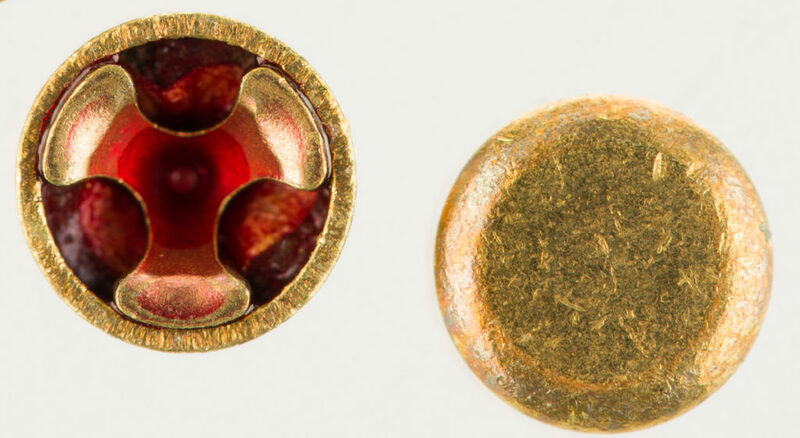 The flash hole is essentially the channel through which the ignition travels; when the firing pin hammers the primer, the primer ignites and the internal explosion travels through the small flash hole. That ignites the powder and launches the bullet toward your target. When the firing pin impacts the primer, it pushes the firing compound into an internal anvil. This creates the explosion. Powder is ignited… and the magic happens! 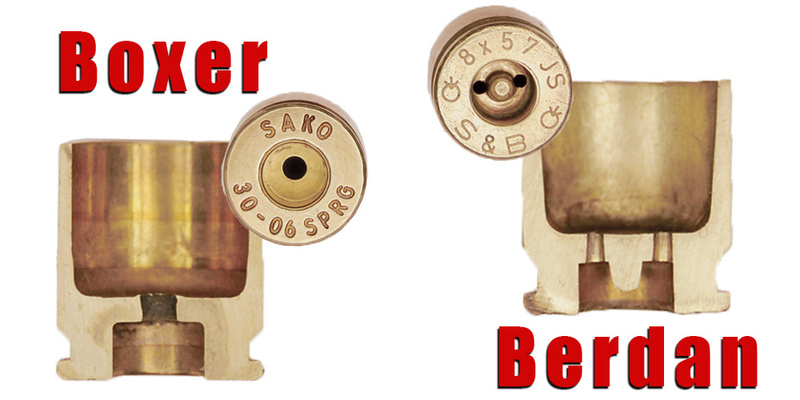 It’s important to understand that both Berdan and Boxer priming systems are forms of centerfire cartridges. Centerfire primers have the priming compound at the very center of the base of the cartridge. Rimfire, the alternate to centerfire, has the priming around the rim of the base of the cartridge and is used primarily for smaller rounds such as .22 Long Rifle and .17 HMR cartridges. An English inventor named Edward Mounier Boxer invented Boxer primers in the 1860’s. 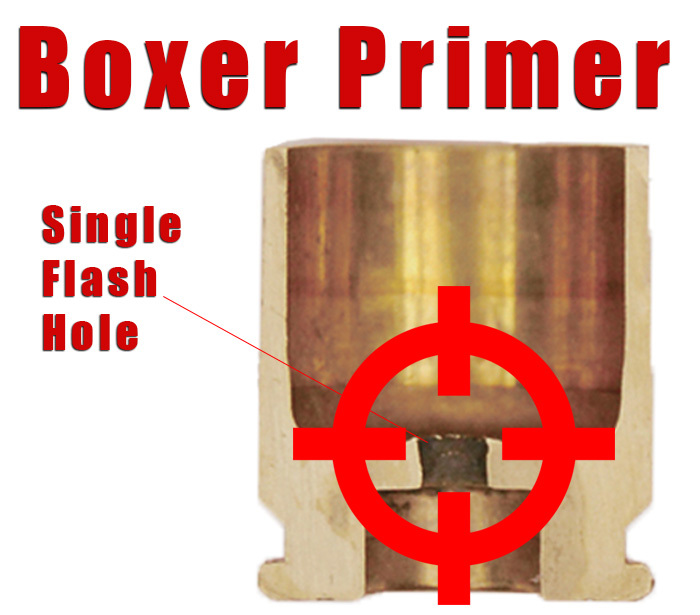 Boxer primers have one flash hole at the very center of the cartridge. When you look inside an empty cartridge, either from the front or from the back (if no primer is loaded), you will see a small hole between the primer recess and the powder space. This flash hole is at the very center of the cartridge. When fired, the firing pin crushes the primer’s explosive material between a cup and an anvil. This produces a hot gas and incandescent particles that push the anvil through the flash hole to ignite the powder. Boxer primers also have the anvil, which is a small projection (like a tiny pen tip) as part of the casing, not part of the primer component. This difference, while seemingly small, will make a difference when using the casing over and over again. In a bit of historical irony, Boxer primers were invented by Edward Boxer of England. Berdan primers have two specific differences that, while perhaps not a concern for typical shooters, can make a significant change in how you reload these cartridges. 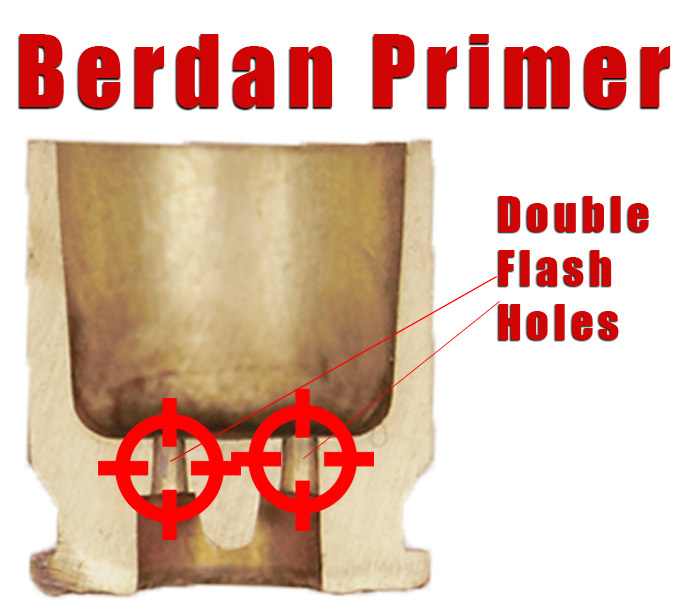 First of all, Berdan primers have two flash holes. When you look at the section of metal on the casing between the main body and the primer recess, you will see two flash holes instead of one. Also, with Berdan priming, the anvil is part of the case and not the primer. This means that the anvil stays with the casing and can eventually wear down after multiple use. So we now understand the physical and structural differences between the two, what does it all mean? When you buy, shoot, reload, and work with these different primers, what will you actually notice? It’s easy to find ammo loaded with either type of primer. For instance, Hornady primarily uses Boxer primers in their rifle ammunition like the Varmint Express .223 in the photo below. Tula, on the other hand, is predominantly a Berdan primer brand and their 62 grain .223 ammo is sold with a Berdan primed casing. Whether you are a casual target shooter, a conceal-carry holder, an elite marksman, or a seasonal hunter, you are likely concerned about ballistic performance and cartridge reliability. 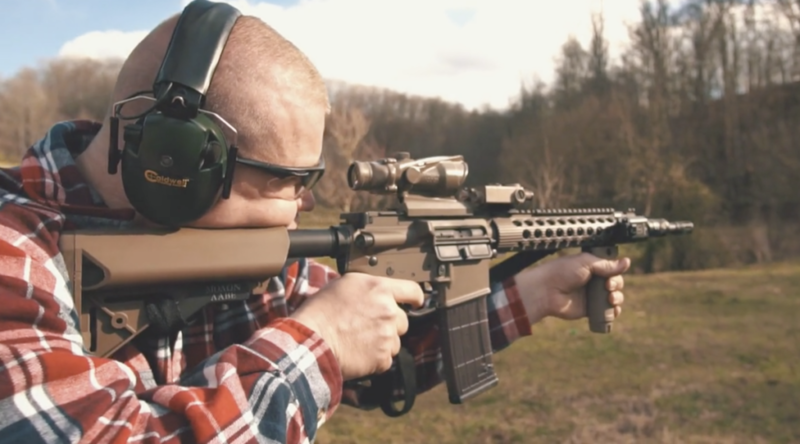 It appears that when it comes to performance, be it velocity, energy, accuracy, or any other factor that occurs after the bullet leaves the barrel, there is no difference between Boxer and Berdan. If all other variables (bullet size, powder load, etc.) are the same, you will see almost no noticeable difference between the two. 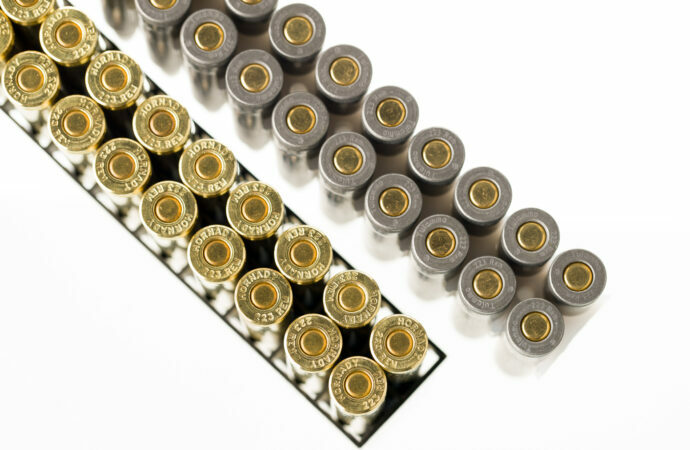 Ballistics are more dependent on powder load, bullet size and shape, and barrel length, meaning the primer type will not make a difference when you are shooting the cartridges. Because pricing is dependent on the seller, the bulk, the cartridges, current availability, and many other factors, it can be tough to say that one is always more affordable than the other. In general, it appears that when purchasing full cartridges for basic one-time use there is little difference between the two. However, if you’re concerned with reloading, Berdan priming may actually be cheaper. This is because with Berdan priming the anvil is attached to the case and not the primer. This means that the primers, which don’t need an attached anvil, are often more simple and easier to manufacture. If you reload, you will likely discover that using Boxer-primed casing is far more convenient and accessible than Berdan. There are many reasons for this, including the fact that Boxer is more common in the U.S., making it more accessible to American reloaders. But access to products doesn’t tell the whole story. There is also the fact that Boxer-primed ammunition, because of the single flash hole, is often easier to assemble. Berdan may require special tools depending on the specific type. Many reloaders feel that working with Berdan is difficult. Part of the issue is a lack of standard sizes. With Boxer priming, there is a set of four standard sizes that are used across the industry. Each size is designed to fit a large section of ammunition. (For example, the smallest size is made for small-caliber pistol and rifle ammo.) However, Berdan primers have far more sizes. Plus, there is little standardization, making finding the right part more difficult. Many shooters worry the Berdan anvil, which is attached to the casing and used over and over, can wear down. With Boxer, you don’t have this problem as the anvil is replaced every time you add a new primer. Most shooters consider Boxer primers handier, more versatile, and more user friendly than Berdan. When all is said and done, understand the fundamental difference between the two is that Boxer priming is a better option for reloading. 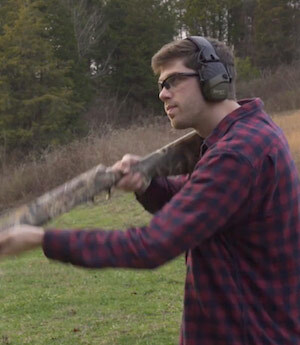 If you are a casual shooter who has little concern for reloading, you will not notice a difference between the two. In fact, as long as you have the right cartridge for your firearm, you may not even notice whether your ammo has one or the other. However, if you are concerned with saving your brass and reloading your casing, you will be better served by using Boxer primed ammunition.